Scrabble, 1960s, V&A Museum of Childhood, London. Photo credit Kelise Franclemont. An exhibition about board games is set up so the displays make up the board and the day’s patrons become the players. In 20 or so “moves”, visitors to “Game Plan – Board Games Rediscovered” can peruse vitrines presenting recreations older than chess and as new as VR, posters with anecdotes and trivia, some game-related paintings, and even incarcerate themselves in a life-sized Monopoly-style “jail” by hitting a forfeit on one of the giant wall spinners. At the V & A Museum of Childhood in Bethnal Green, ends 23 April 2017. For a few years growing up, we didn’t own a TV, so family game night was our Saturday entertainment. Multi-player card classics such as Canasta and Rummy were a favourite, or for quieter nights, a board game from the cupboard. Last week, I was in Bethnal Green and so, having never been into the V&A Museum of Childhood, quickly popped in… for a 5-minute gander at their board games exhibition, that lasted more than an hour. Inside the V&A Museum of Childhood, view from the upper mezzanine. Photo credit Kelise Franclemont. My usual m.o. at a new museum or gallery that I’ve never been to is to start from the top and work my way down, and from the upper mezzanine, the place resembles a Santa’s workshop that grew up inside of a train station. As I had only five minutes (an hour), my first move was the “Game Plan – Board Games Rediscovered” exhibition on the top level. To start, visitors are invited to “explore the exhibition by playing a game” so that, if you want, you can “play” the exhibition or just look at it. Someone else was having a turn on the spinner, so I just went in. Snakes and Ladders, 19th century, India, V&A Museum of Childhood, London. Photo credit Kelise Franclemont. Pachisi, 19th century, India, V&A Museum of Childhood, London. Photo credit Kelise Franclemont. Joseph Clark, ‘The Draughts Players’, 1834-1926, oil on canvas, V&A Museum of Childhood, London. Photo credit Kelise Franclemont. The Amusing Game of the Goose, 1580-1600, parlour game, V&A Museum of Childhood, London. Photo credit Kelise Franclemont. Trivial Pursuit, 1980s, V&A Museum of Childhood, London. Photo credit Kelise Franclemont. Clue (US, or Cluedo UK), 1949, V&A Museum of Childhood, London. Photo credit Kelise Franclemont. Monopoly, 1930s, V&A Museum of Childhood, London. Photo credit Kelise Franclemont. Virtual Chess, 2010s, interactive game with smartphone, V&A Museum of Childhood, London. Photo credit Kelise Franclemont. At the end of Game Plan, I felt like a winner, and with that five (20)-minute tour done, it was time to get going. Rubik’s cube, 1980, V&A Museum of Childhood, London. Photo credit Kelise Franclemont. Mastermind, 1978, V&A Museum of Childhood, London. Photo credit Kelise Franclemont. Troll dolls, 1980s, V&A Museum of Childhood, London. Photo credit Kelise Franclemont. Barbie by Mattel, 1960s-1980s, V&A Museum of Childhood, London. Photo credit Kelise Franclemont. Star Wars action figures, 1970s-1980s, V&A Museum of Childhood, London. Photo credit Kelise Franclemont. Vitrines of beautifully displayed vintage nursery and play clothes round out the collection, so that one can just about imagine who played with the antique miniatures and doll houses that my Barbies would have dreamed of living in. Antique doll-house, 1700s, V&A Museum of Childhood, London. Photo credit Kelise Franclemont. Children’s nursery/play-wear, 1700s, V&A Museum of Childhood, London. Photo credit Kelise Franclemont. ‘Make believe’ dress-up area, V&A Museum of Childhood, London. Photo credit Kelise Franclemont. And a display of children’s drawings from the 19th century. So universal is the first language of art, that these could have easily come from the pencil of a six-year-old today. Sample of children’s art by Margarete Hamerschlag (b. 1902), V&A Museum of Childhood, London. Photo credit Kelise Franclemont. A child artist, Margarete Hamerschlag (b. 1902), V&A Museum of Childhood, London. Photo credit Kelise Franclemont. Right, so my five-minute tour has now been almost two hours, and the only two questions I ask myself now are: (1) how have I been a Londoner for 15 years and never stepped into the V&A Museum of Childhood before today? And (2), what magic lies in this colossal glass imagination box, and how do I get inside? Central display case, V&A Museum of Childhood, London. Photo credit Kelise Franclemont. London E2 9PA, from 8 October 2016 to 23 April 2017. 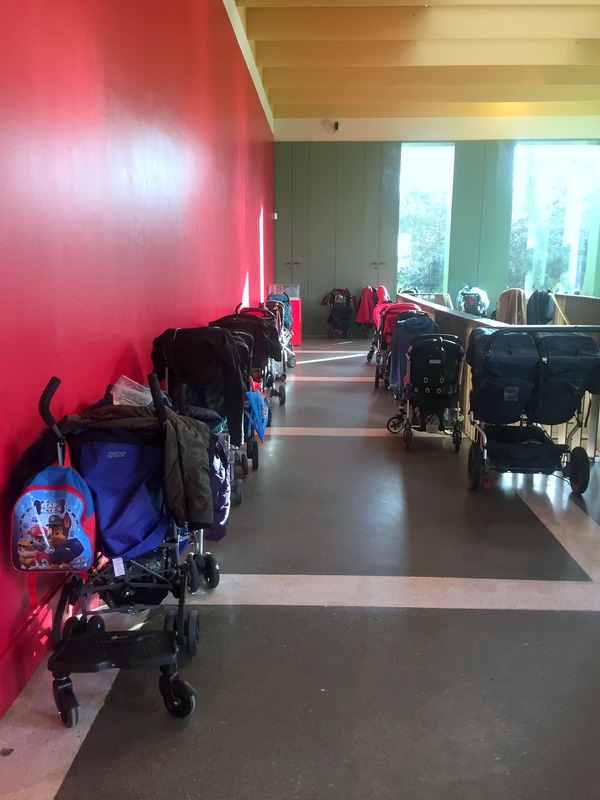 Step-free access, free admission (with ample “parking” for prams); cafe on location. V&A Museum of Childhood, London.